Includes cover of Small Faces "My Way Of Giving" plus "Gloria Drank Dirty Water on Her Way to the 99th Floor"
Ralph's 2nd CD (an EP, actually) is entitled Olympia '66 and was recorded live-to-DAT in June of 1995 in Vancouver. Olympia '66 features special guest Stephen Quinn on guitar and is "a loving tribute & travelogue through 60's rock, Beat music, French YéYé and the Mod experience." The EP is distributed by Outside Music in Canada (call: 1-800-494-2770) and is available in most Canadian record stores. One of last summer's pleasant surprises was the debut Ralph CD, Coffee, Jazz and Poetry. #1 at CKUL Lethbridge for something like 10 weeks in a row!! Ralph's sweet take on lounge, jazz, spoken word and garage rock has made him one of Canada's most endearing eccentrics (see ex-fiancée quote above). Ralph is many things; a monthly beat poetry zine (circulation 3000), a musical group of bongo crazy beatniks...but mostly, it's Ralph Alfonso, a name familiar to most everyone in the music industry for his work as a designer & his years promoting Canadian music at WEA Canada, Attic, and Capitol-EMI. Tom Cochrane, The Nylons, Glass Tiger...yeah, they've all yelled at him. 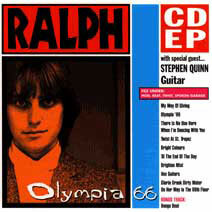 Olympia 66 is Ralph's second CD release; a special EP exploring the straight line from 50's Beat culture to the 60's UK Beat music explosion...primarily the Mod lifestyle, with sidetracks into French yéyé (the title track is a tribute to Johnny Hallyday) and U.S. garage rock....from one record collector to another. The Pretty Things, Small Faces, Yardbirds, Stones, Who, Standells, etc.....if you don't know what any of this means; you will after listening. "Basically, it's just me on vocals with my friend Stephen Quinn on loud, revved-up guitars, recorded live in a sweaty club, playing our hearts out. Recorded straight to DAT. No overdubs, no nothing, just a total desire to celebrate the energy of Beat." says Ralph. Guitarist Stephen Quinn is known for his years in cult faves Go Four Three and his current pop band, Thrill Squad. Ralph's unique interpretation of "My Way Of Giving" by The Small Faces is already getting airplay on CBC Real Time and CBC Night Lines. Olympia 66 also includes Bongo Beat, featuring the full Ralph combo. This is the highlight of the Ralph live show & previously unavailable. As always, tons of liner notes & photos, extensive lyrics plus transcriptions of all the spoken introductions. It's the same attention to extras & detail that made his design work on the Zulu punk re-issues & the Grapes Of Wrath greatest hits so popular. "It's kinda like a pop lecture on the essence of 60s rock as seen through my experiences. It's really hard to explain because I don't think anyone's ever done anything like this, but it makes total sense once you see it and hear it." The Ralph band will be on tour across Canada in July-August. Yes, there will be videos! "I never thought I would ever see anyone dancing to spoken word, but I think it's cause we make our live shows a lot of fun. It reminds me of when I used to manage The Diodes & being a part of that early punk scene, because we're trying to do new things with the left-overs & rubble of everything we like that's already gone before."